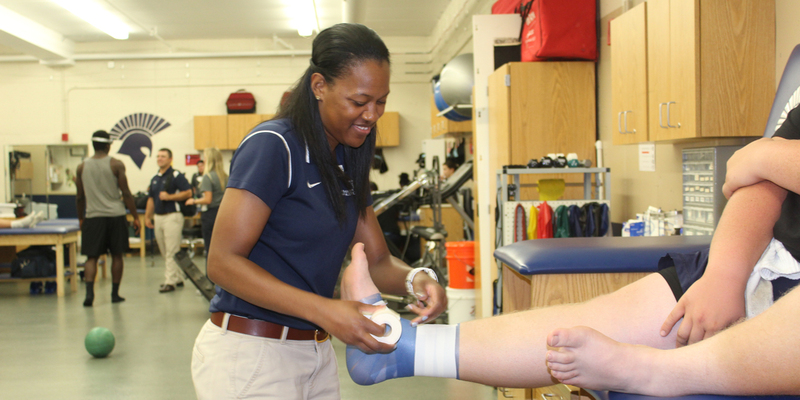 MBU’s Athletic Training Department has experienced extensive growth with the addition of new sport teams on campus. The trainers have unified to serve athletes spiritually and physically. The Athletic Training Department at Missouri Baptist University has increasingly grown through the years, originally located in Muncy Gymnasium and moving to the Carl and Deloris Petty Sports and Recreation Complex in 2011. The department treats 27 teams with many different and unique treatment plans. Since MBU’s athletics have grown to over 700 student-athletes, so did the Athletic Training Department. “I like how this school has such a large volume of student athletes and how it is a really diverse school that you don’t really get at other universities,” said Kelly Kennealy, graduate assistant for football and women’s basketball. Each graduate assistant is assigned specific teams to treat and train. “The growth in sports, which in turn grew the student athletes, which in turn, we had to grow as a staff in order for us to be able to provide the best health care that we can for the student athletes,” said Meredith Dill, head athletic trainer and instructor of health and sports sciences. The staff has grown to nine training staff members, including interns, graduate assistants and full-time faculty. “The growth in staff brought staff from many different areas of the United States and they were able to bring in techniques and skills to MBU, which we have implemented,” said Dill. As the staff has grown, they continue to explore new and improved treatment care. Even after students graduate from MBU, they continue to invest in the Athletic Training Department not only physically, but also mentally. “We put God first in literally everything that we do. So we try to treat our student-athletes, coaches and other schools the way God would have us treat them,” said Ashley Broughton, assistant athletic trainer. The Christ-centered focus allows trainers the ability to share their faith willingly. Because of their dedication to students and to the university’s Christ-centered focus, the staff has become a cohesive unit in training their student-athletes. The staff meets weekly to keep informed and updated on what is happening around campus and how they can improve their treatment for student-athletes. “I like that you never are completely on your own. Definitely the way the entire athletic department comes together to work as a unit is unique at MBU,” said Friesen. The athletic trainers really even become your friends through the years. Sarah Koenen, junior human services major, is a cheerleader for the spirit program. With her three years of experience, she understands the importance of building a strong relationship with your trainer. Regardless of where the trainers or athletes came from, they aspire to serve God and each other through sports. Lynn Tyler is a contributing staff writer and anchor for MBU Timeline. She is majoring in communications studies with an emphasis on broadcasting. Tyler participates in the cheerleading squad. In her spare time, Tyler enjoys the outdoors, working out, improving her cheerleading skills and spending time with her family.